The sprues were sold at 5 GBP each, so I assume a later box price of 20 GBP for a box of 20 (similar to the Frostgrave plastic pricing). I was able to get a sprue at Salute, and want to share my impression with you in this brief review. 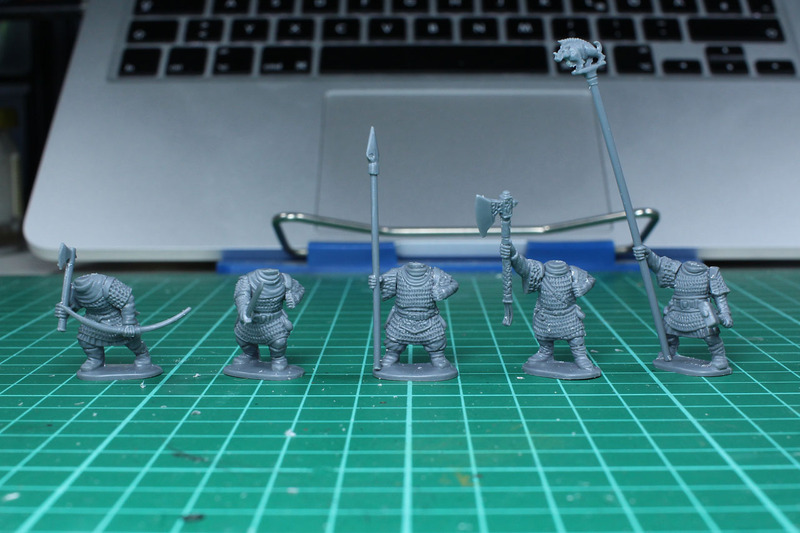 Each sprue covers enough parts to build 5 dwarven warriors, with a variety of weapons, among them spears, swords and bows. 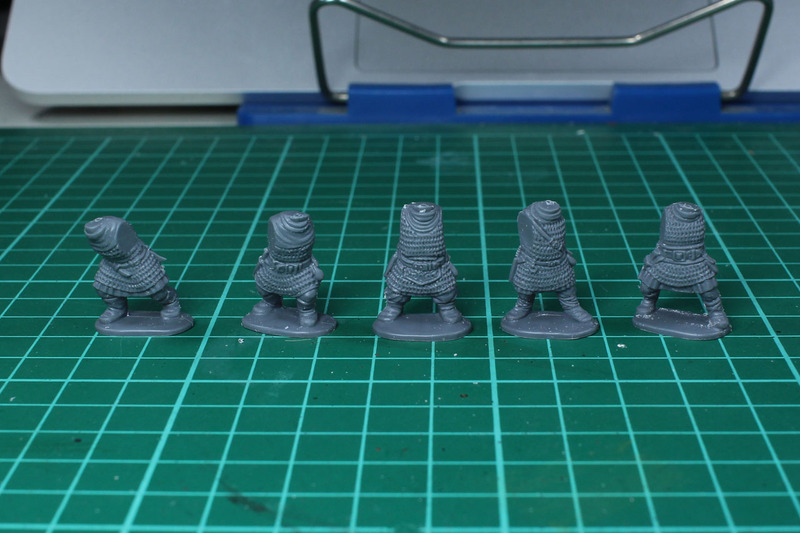 Beginning with the 5 different bodies, all of them wear chainmail and leather belts. The proportions are not to overdrawn, and from the first impression they have a norse style to them. 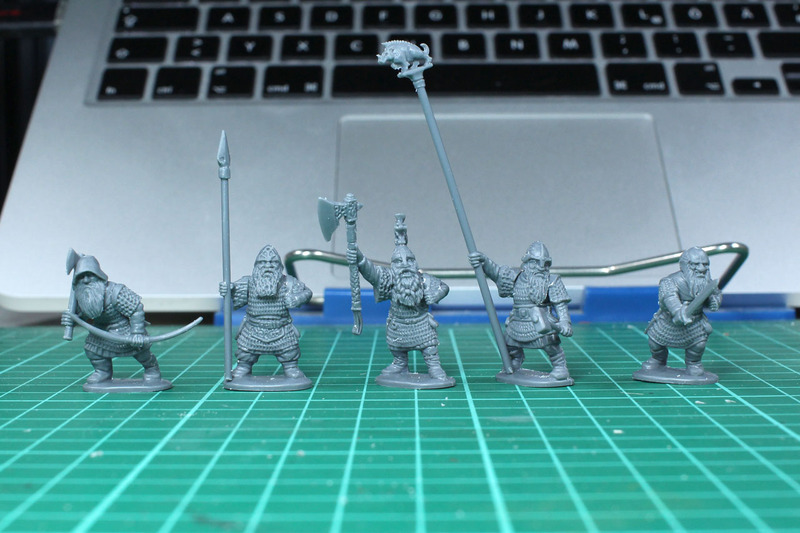 I went with a random choice from the weapon variety, so the dwarves could be as a small warband for example for Frostgrave. From left to right, axe with bow, sword and shield, spear and shield, champion with large axe and shield, banner bearer with off-hand hammer. The fit is quite good. 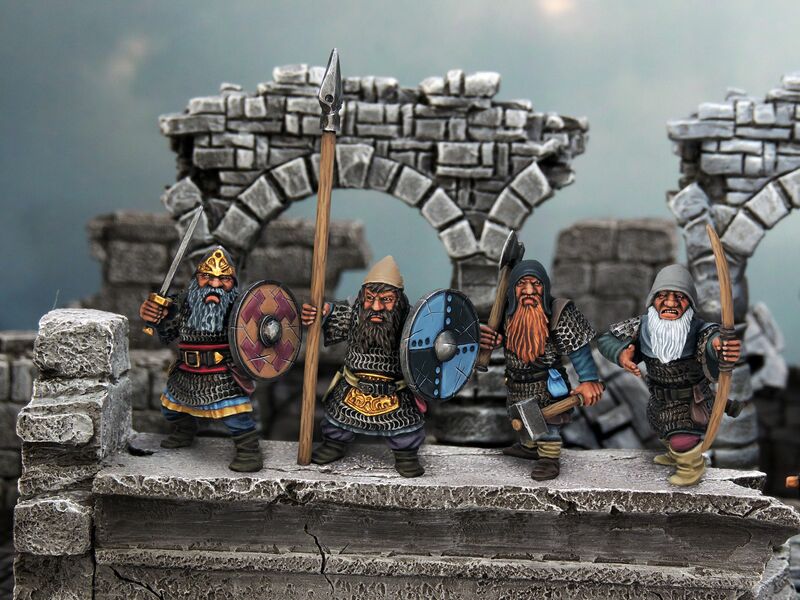 The transition with mail armour is always difficult, Gripping Beast has similar problems with their dark age range. But due to the cloth around the neck, that is not that big of a deal. Beside that, dwarves have beards and broad faces, so this will cover some of the neck area as well. You get to choose from 11 heads, including the one for the "champion". 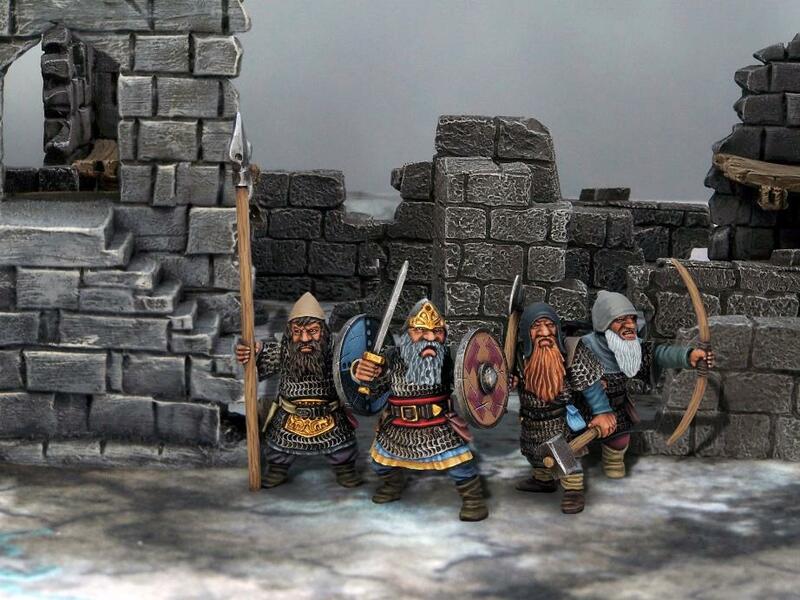 The faces are all bearded, but come with hoods, bald or helmets. The design is kept again rather norse / germanic, as you would expect it from fairy tales or similar. 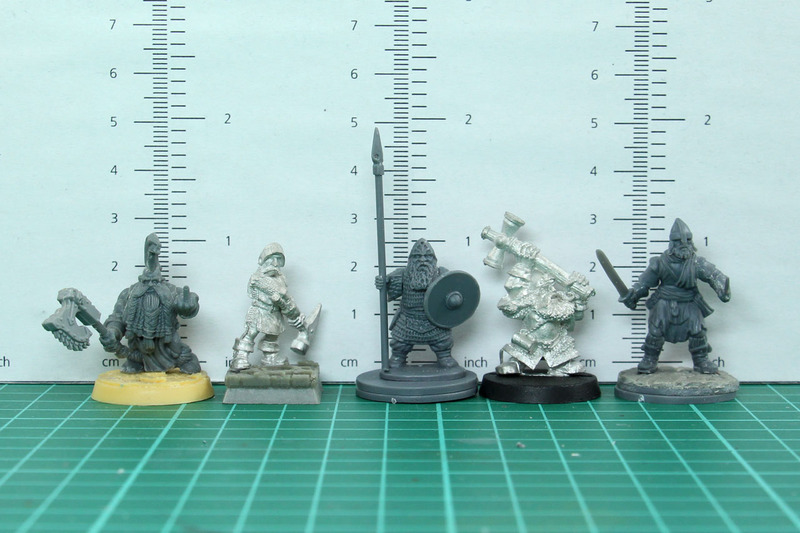 As you can see in the comparison with other Dwarves (from left to right; Avatars of War, Hasslefree, Osprey / Northstar, Games Workshop and a regular Human from the Frostgrave Range), the Osprey / Northstar dwarves are still quite human looking. They have knees and rather small / human like feet and hands. 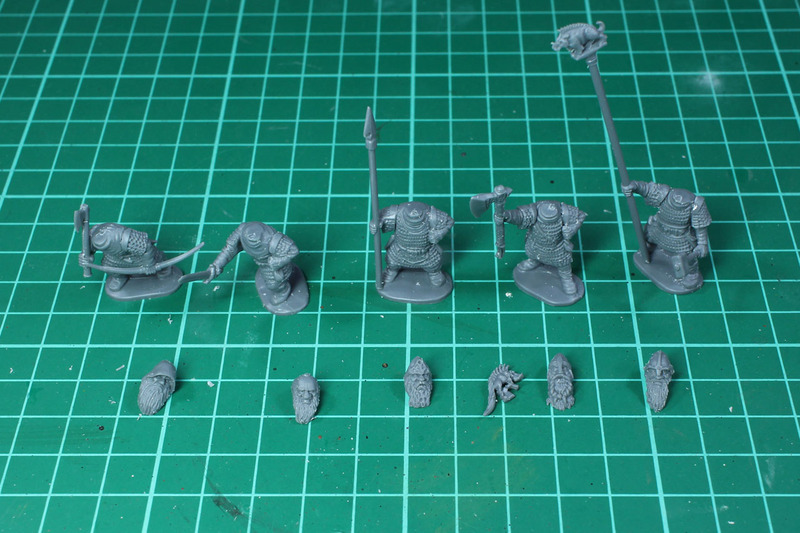 The finished small warband from a single sprue, with lots of bits left over, gives you this. The small bases are large enough for them to stand on. Easy and fast to build, torso, arms and head, you're good to go. But they feel a bit naked, as they carry no gear or luggage. It is going to be interesting to see, what Osprey and Northstar make out of this. 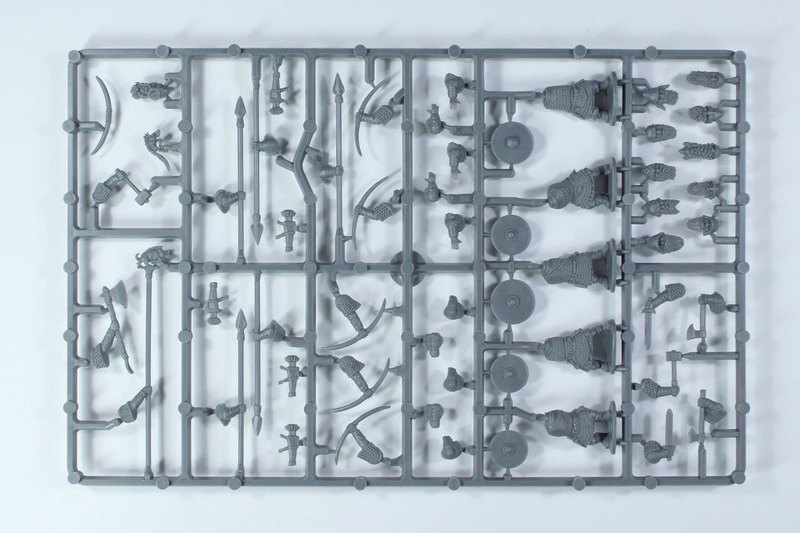 As they already announced, that this kit won't stay on its own and others for Elves and Goblins/Orcs will follow. Quality of the casting is good, only minor mould lines to take care of and the sculpts are solid. 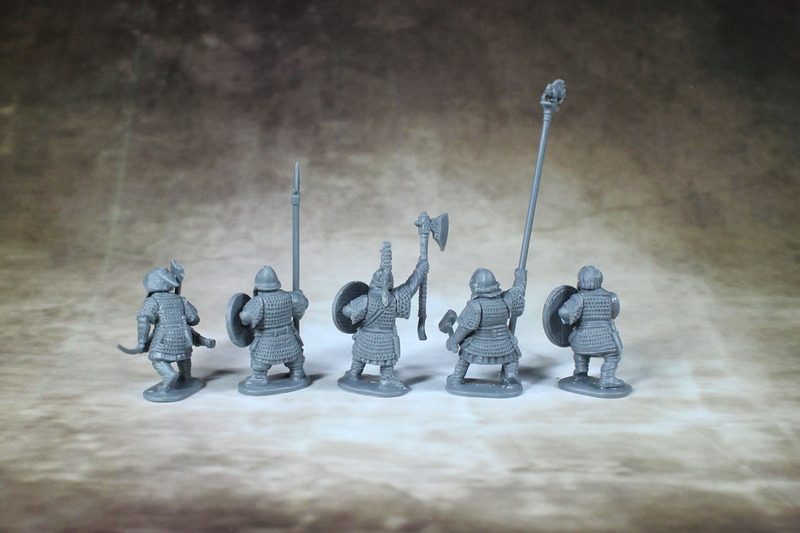 Pricing is okay, at 1 GBP per miniature it is a fair price and I assume that - if or when - the rules follow, it is going to be around the size of SAGA and not some mass combat system. 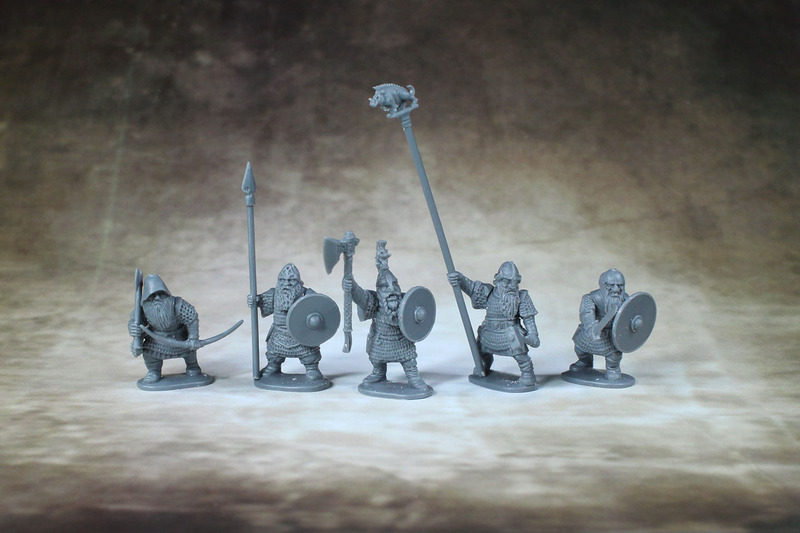 With the current assumed price of 20 GBP for 20 soldiers, its right in the middle between Mantics plastic dwarves at 18 GBP for 20, and Games Workshops currently still available 16 dwarf / "duardin" warriors at 20 GBP. 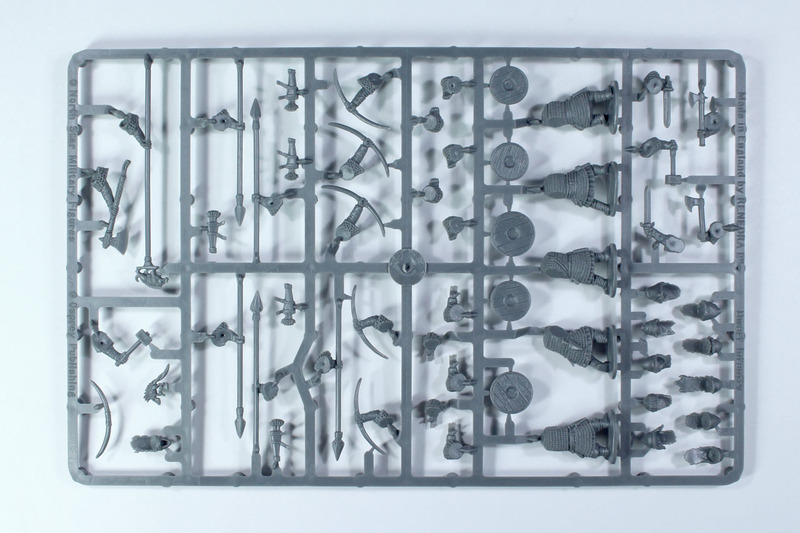 The only thing about this sprue / kit so far, that bothers me a bit, is that it lacks a bit of love. The proportions could be a bit more squatty, with larger boots and hands, but beside that, there are no small bits and pieces in there to customize your soldiers. I'd expect some mugs, some gear for the belts, a lootbag, a pickaxe, a lantern or candle. 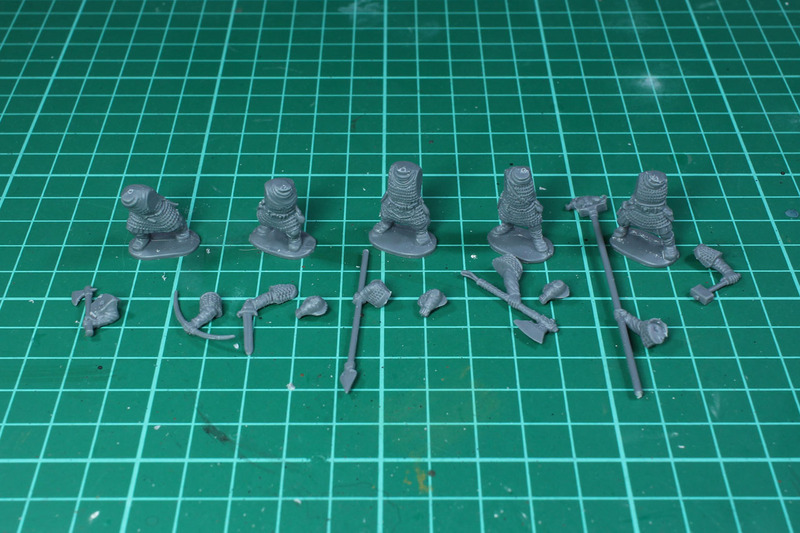 You can use some of the bits from the Frostgrave Adventures sprue. But never the less, you need to buy another product else to get something, that should be included in here in the first place. 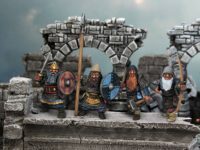 It has the potential to be a good kit (maybe Northstar will supply a few metal parts, like they offer with Frostgrave), but with the mentioned aspects it is "only" okay. 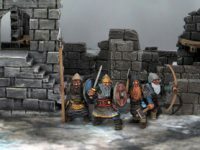 Yes, it offers more variety than the Kings of War budget dwarves, but it is only more dynamic than the 15 year old set by Games Workshop, but lacks the amount of bits and variation that one has. Ja, das sollte funktionieren, dürfte aber von den Proportionen her schwierig werden.